Entrance to Swetland’s Sweet Shop, circa 1900. 1880s trade card for Swetland’s in Springfield, Massachusetts. One of the first confectionery shops to be established in the Northwest opened for business in Portland in 1886 at 51 Washington Street under the guiding hand of Edwin Payson Swetland. 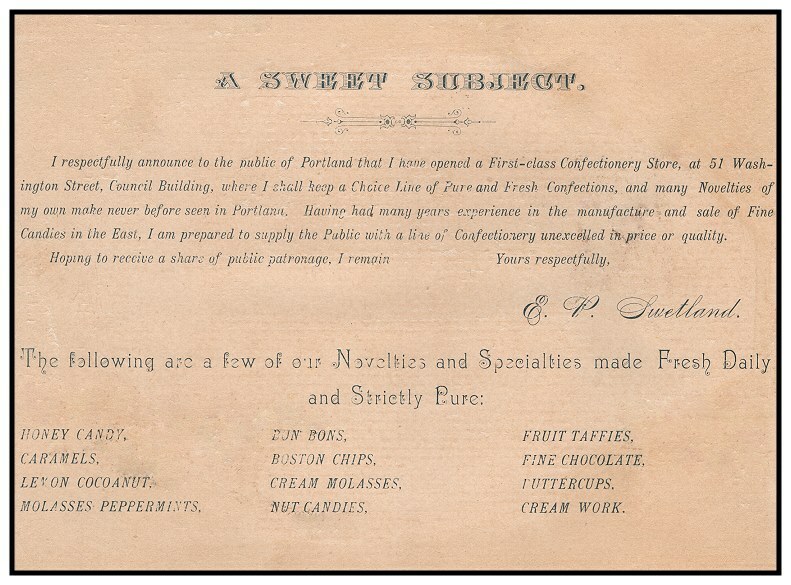 The Swetlands were a family of confectioners and they had operated a similar establishment in Springfield, Massachesetts before moving their family and business to Portland. Edwin and Laura’s sons, Louis and Lot, were both active in the business. The first ad for Swetland’s appeared in the Portland Oregonian on August 11, 1888. 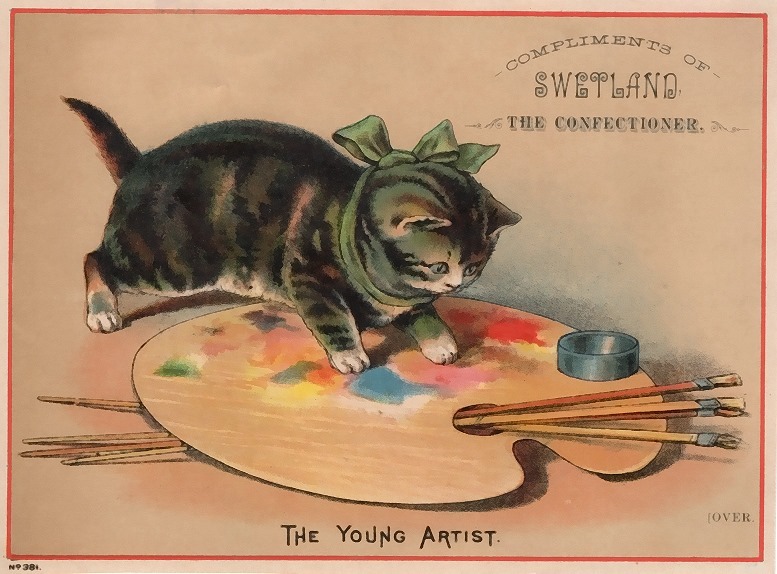 Opening announcement trade card for Swetland – The Confectioner, published in 1886. 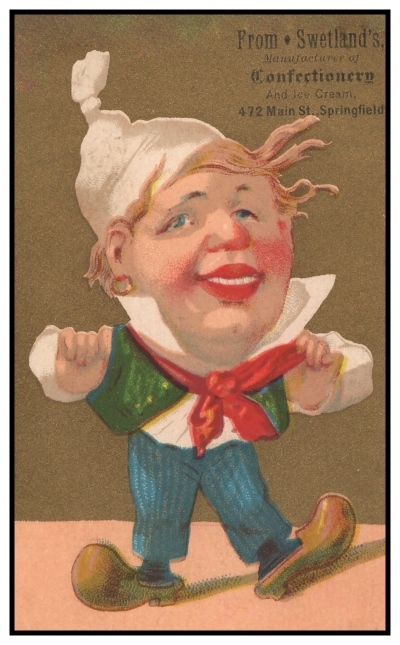 Reverse side of opening announcement trade card for Swetland – The Confectioner, published in 1886. 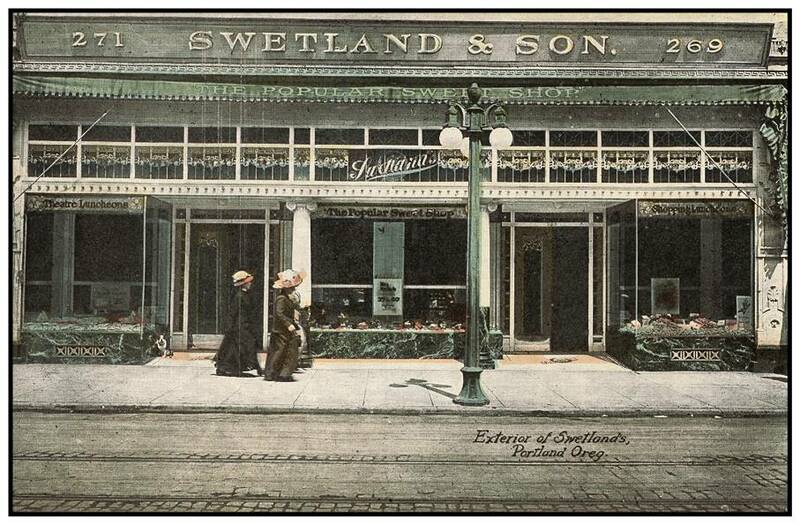 The first ad for Swetland’s appeared in the Portland Oregonian on August 11, 1888 and their address was listed at 48 Morrison Street. Swetland’s placed ads in the Oregonian later that year announcing six flavors of Boston Chips, candy priced at 15 cents a pound and crystalized flowers just received direct from Paris. 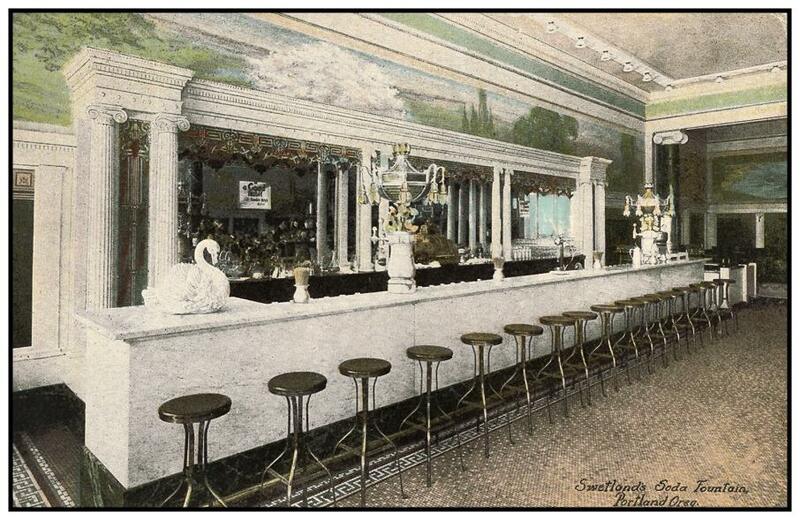 In 1890, Swetland’s advertisied on June 7 that they had opened new “ice cream rooms” and by October they served oysters and welcomed shopping luncheons for the ladies. In November 1890, they advertised that they served “coffee royal” and in June of 1891, they delivered ice cream to picnics and parties. On Dec. 16, 1893, Swetland’s advertised under Help Wanted – Female: “Bon Bon dipper first class.” It was announced on July 4, 1898 that they had moved to a new store at 273 Morrison, near Fourth Street. On December 10, 1898, Swetland’s announced that they were selling candy in fancy Indian baskets for Christmas. It was announced that chicken pies were available noon to midnight on Sept. 15, 1901. An article appeared in the October 6, 1901 edition of the Sunday Oregonian to announce that “Messrs. Edwin and Louis Swetland had disposed of their interests in the firm to Lot Q. Swetland whose energy and familiarity with the business will enable him to add to the spendid reputation already established by the house. During the past 15 years, sweetmeats and Swetland’s have been almost synonymous terms in the minds of Portland people. It has been almost impossible to think of one without the other. During all these years, this house has held a high place in the estimation of the public, and it has earned its reputation by maintaining at all times the highest standard of excellence in all its manufactures. Perfection and purity have been, are, and will be its ideals. 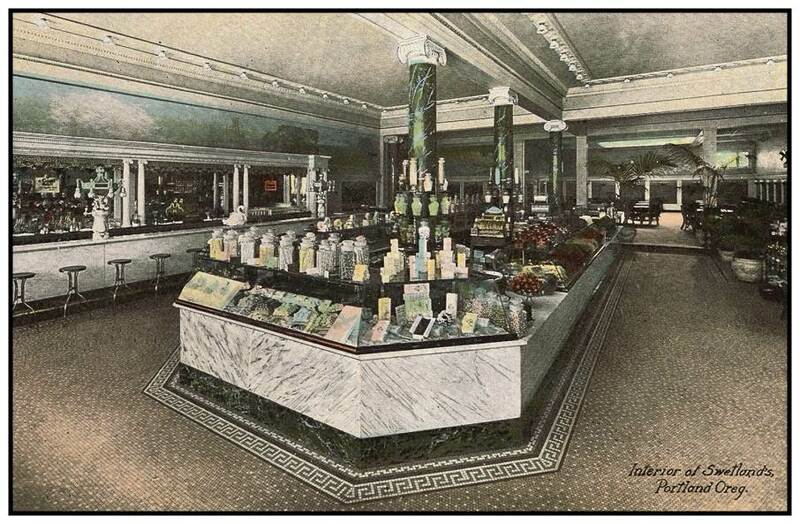 In 1902, Swetland’s advertised that they offered “Frozen Dainties and Creamed Strawberries.” An announcement appeared in the Oregonian on May 31, 1903 that Manager L.Q. Swetland (former proprietor of Swetland’s) had opened Swetland Candy Company at 344 Washington Street where he oversaw the manufacture of Swetland’s candy. 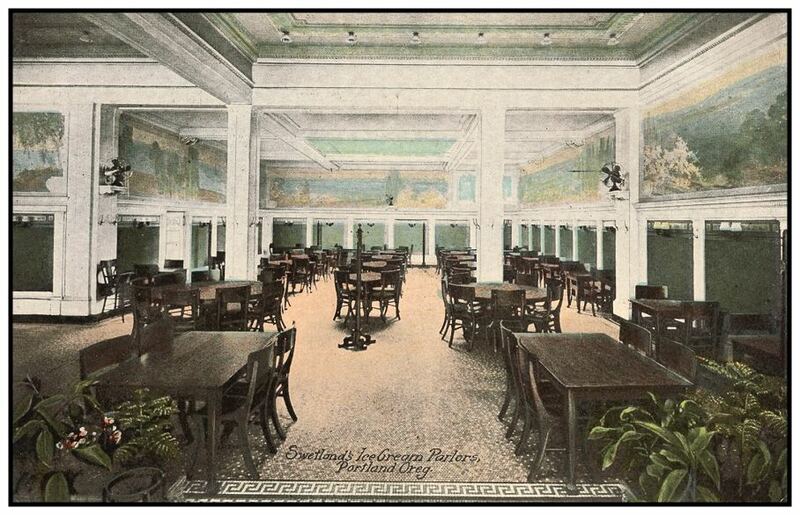 A postcard with an artist’s conception of the proposed Swetland Building was published in early 1908. The artist had signed the drawing in 1906. 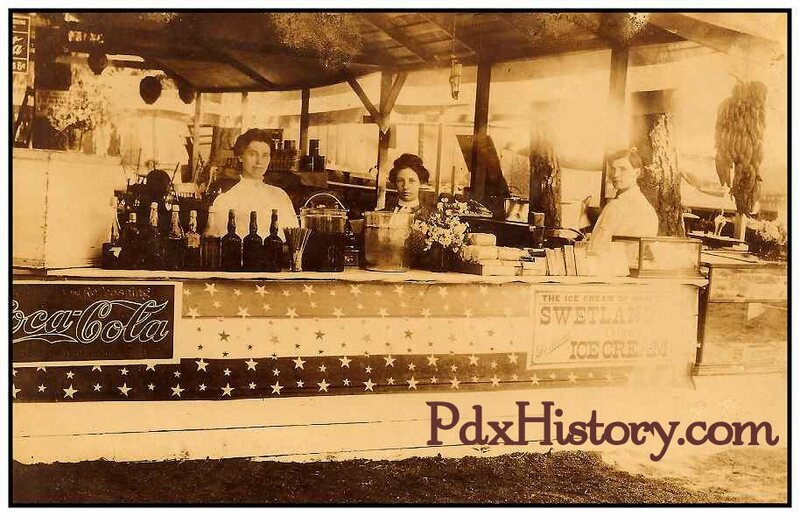 This postcard which was postmarked July 16, 1908 shows an outdoor ice cream and refreshment stand serving Swetland’s Ice Cream. An assumption could be made that this was an Independence Day celebration at a fair or an amusement park such as Oaks Park. On April 6, 1909, an announcement in the Oregonian noted that Swetland’s had moved to new and larger quarters at 269-271 Morrison Street. Interior of Swetland’s Sweet Shop. 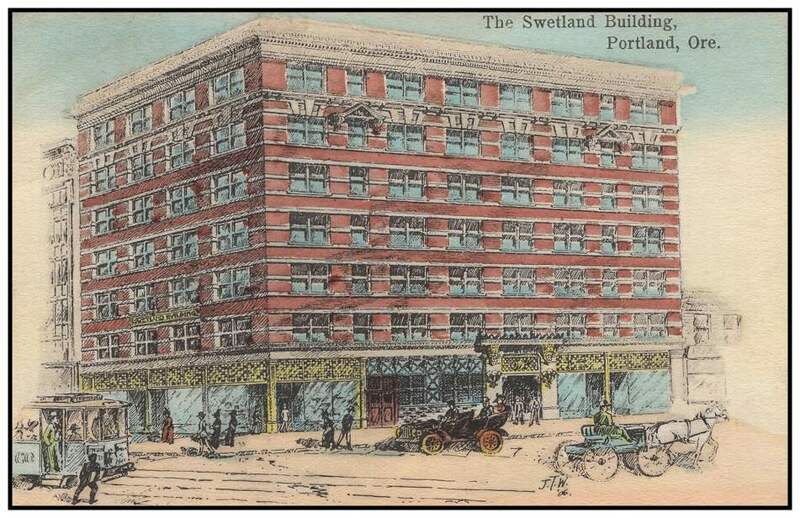 On March 2, 1910, an article appeared in the Oregonian announcing that plans were underway for a new 15-story Swetland’s Building. No mention is ever made again about this new building. On July 2, 1910 an announcement appeared in the Oregonian that the “Ice Lady from the North Pole” would be chiseled from a block of ice at Swetland’s and would be on display from 1:30 pm to 10 pm. Another article in the August 19, 1910 edition of the Oregonian announced that Lot Q. Swetland was elected a National Director of the Rotary Club in America which was formed that same year. 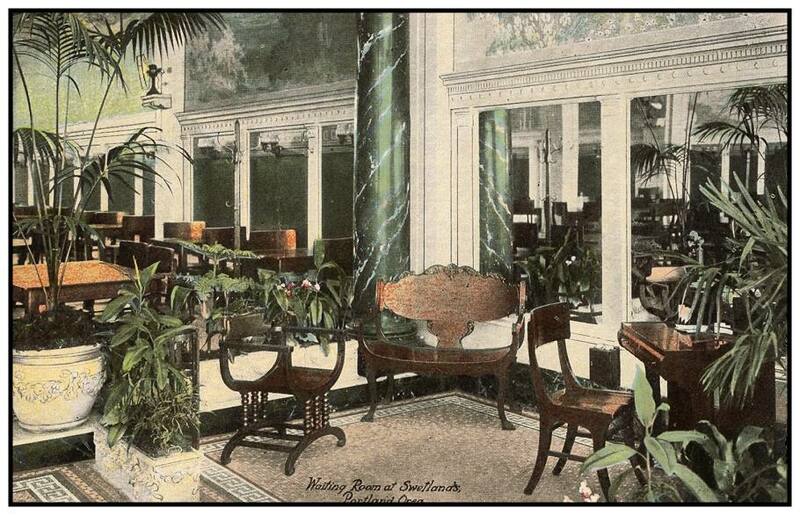 View of Swetland’s Ice Cream Parlors and Meeting Rooms for luncheons. Another article appeared in the Oregonian on April 12, 1914 to announce that L.Q. Swetland, former manager of the Perkins Hotel, was elected National Vice President of the Hotel Men’s Mutual Benefit Association. A fire in the Alisky Building (formerly Swetland’s Building), which was mentioned in an article in the August 4, 1915 edition of the Oregonian, caused $2,500 damage to Swetland’s. Higher losses were mentioned for other tenants in the building including: Skidmore Drug Store, Samuel Rosenblatt’s Clothing Store, Portland Photo Supply, Davies’ Studio and Rich’s Cigar Store. The paper reported that Davies’ extensive negative collection was destroyed. 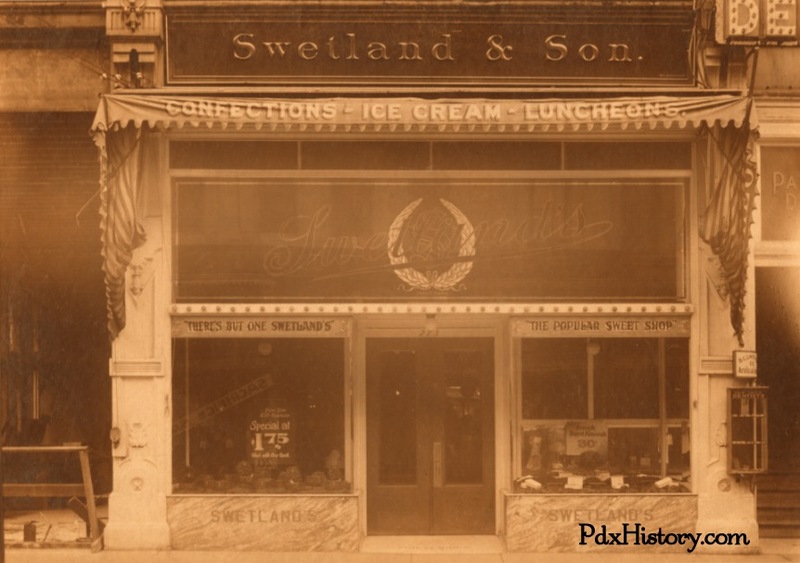 On October 13, 1924, the Oregonian reported that Swetland’s, located at 344 Morrison Street, Portland’s oldest confectionery store, closed its doors. The owner of practically all of the stock in the corporation, J.E. Hawkins, sold all of the assets at a profit and paid all of the bills. The article further states that Hawkins had purchased the business several years prior from the Swetland estate and moved the business to its final location about two years before the closing. He said the demand for the business location made it more profitable to sell the long-term lease.